Next morning we got away about nine o’clock and headed northbound on I-25 for Rocky Mountain National Park (RMNP). We hit some heavy traffic again but not so bad as coming into Denver the day before, and soon enough we were at the speed limit and making good time. We exited the freeway at the highway 66 junction and traveled west for a bit, then northwest as the road becomes Highway 36 toward the town of Estes Park, the gateway to RMNP. 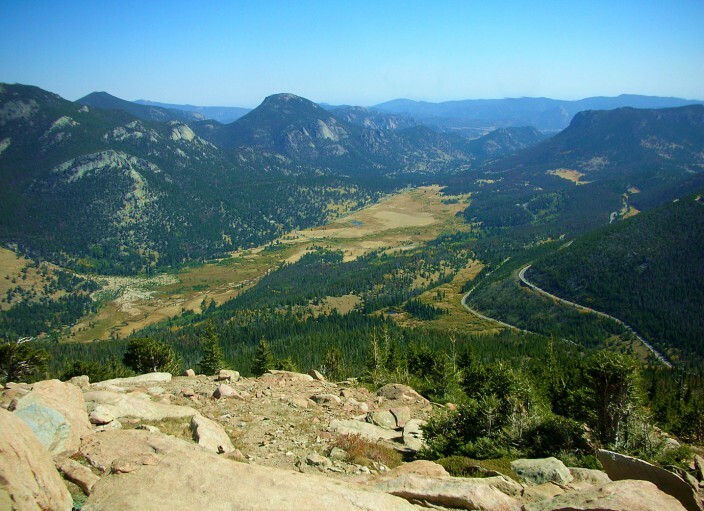 Add Highway 36 to the list of fabulous scenic drives through the mountains of Colorado, as it ascends relentlessly from around 5,000 feet to 7,522 feet, the elevation of Estes Park. Of all the beautiful natural settings I’ve ever seen for a city, this one has to rank near the top. 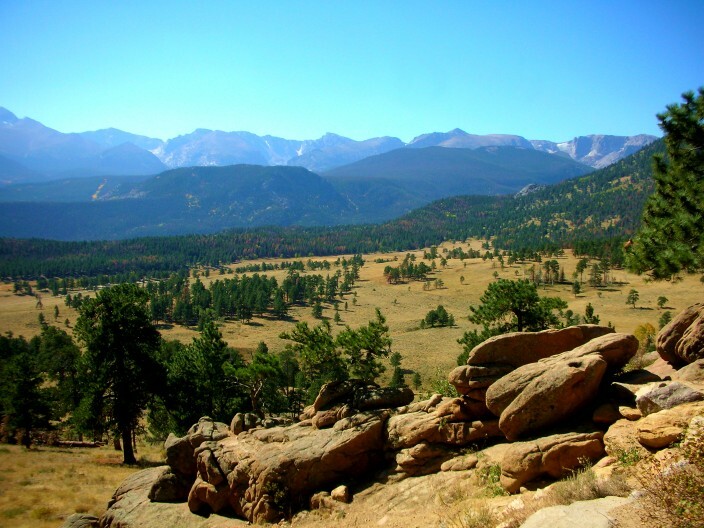 The town is situated in a bowl completely surrounded by mountains, with lovely Lake Estes spreading out before you as you come into town. As we passed a city park we noticed a number of people congregating near the lake, and saw several groups dashing across the grass grasping their cameras. I couldn’t see what all the fuss was about, but pulled in and parked. 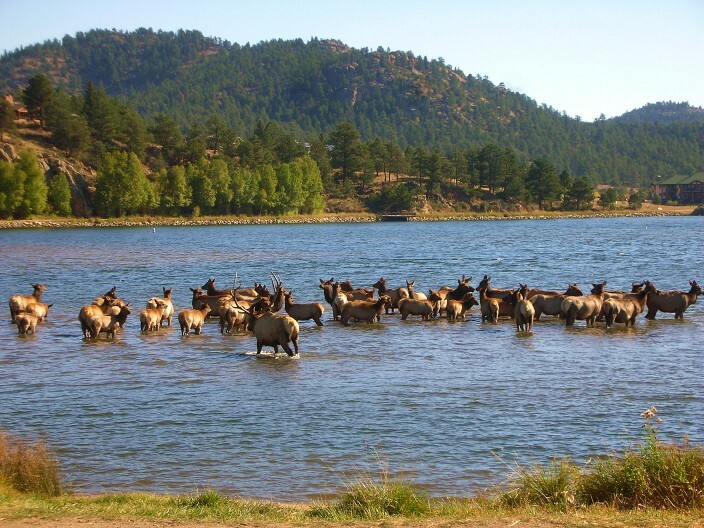 Then I saw them, a large herd of thirty-five or forty Rocky Mountain Elk meandering near the lake’s edge. We soon joined the knot of gawking tourists gathered around the huge beasts, and started snapping away with our cameras like everyone else. This went on for several minutes before I had the sudden and unsettling thought of how stupid it was to get so close to these animals. A bull elk could rip you open with his antlers in a heartbeat if he felt like it, and just because they appeared oblivious to our presence didn’t mean one couldn’t charge you in a split second. To make it even worse, I did some research after we returned from our trip and learned these animals are suffering from what is called Chronic Wasting Disease, or CWD, a condition which affects their brains similar to Mad Cow Disease in domestic cattle. 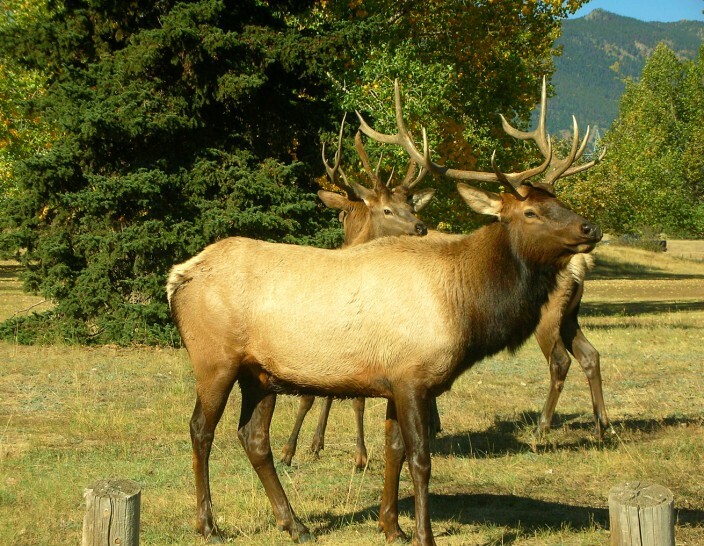 The article I read mentioned this herd around the Estes Park area in particular, numbering more than 3,000 elk. So add this to the list of Stupid Things I’ve Done In My Life And Gotten Away With. But still probably not the dumbest, and no, I’m not telling you what that is. While the elk showed zero interest in or fear of humans and we ran around like maniacs taking pictures, a few of the humans took a blind eye to all the commotion as well. About a hundred feet away, one man sat on his lawn chair fishing from shore and never blinked, while an older couple walked by at a steady exercise pace paying no heed whatsoever. I figured they must be locals who see this every day. Well, I don’t see this every day, so we got lots of incredible photos and video of the herd. Two bulls escorted about thirty cows out into the shallow water where they stood around for some time. Four other males remained on shore in the park, probably young guys without mating privileges tagging along with the group. We drove on through town, passing about 800 tourist souvenir shops along the main drag, but we weren’t stopping for that today. Just a couple of miles up the road on Highway 34, we stopped at the Fall River park entrance and briefly checked out the visitor center, but were told that Alpine Visitor Center, further inside the park, was bigger and more comprehensive. We hung out long enough to glean a few facts and left. 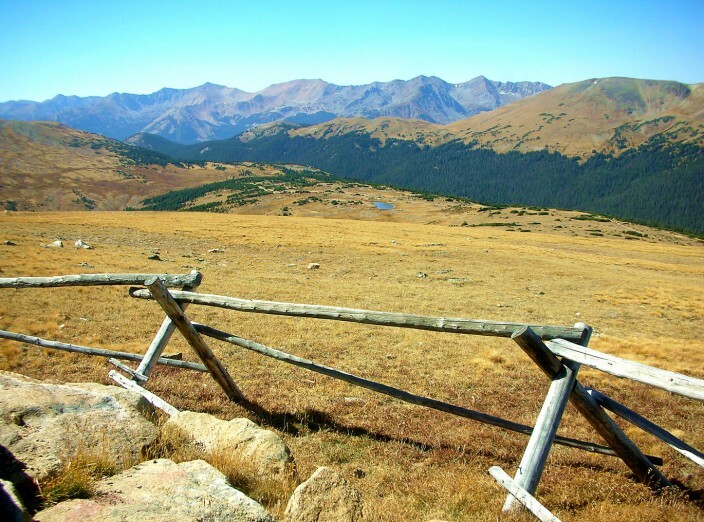 Rocky Mountain National Park, established by Congress in 1915, encompasses a quarter million acres, with nearly one-third of it above treeline. The park holds 150 lakes and ponds, and has 72 named peaks of over 12,000 feet in elevation, Longs Peak being the highest at 14,259 feet. 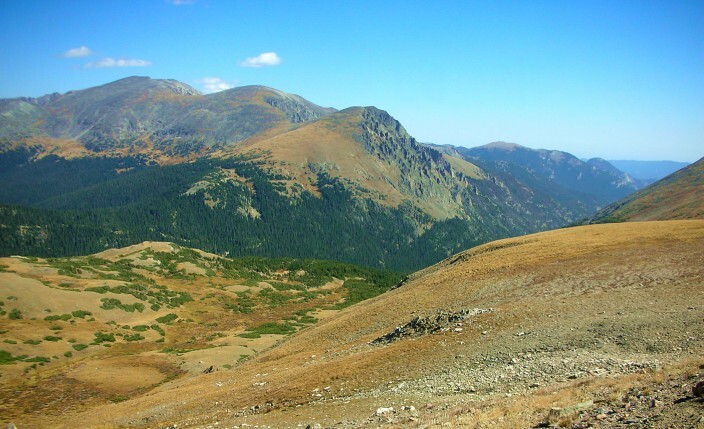 Highway 34, also known as Trail Ridge Road, traverses the park, crosses the Continental Divide, and is the highest major highway in North America, topping out at a literally breathtaking 12,183 feet above sea level. When we reached that point on the highway I found a turnout and parked, got out and ran down the trail a couple of hundred feet, took some photos and ran back just to see how dizzy it would make me. It worked. I didn’t feel terrible, but the activity induced a noticeable shortness of breath and a slight hammering in the head, certainly more than a short jog should produce. I sure wouldn’t want to try playing a soccer game at that altitude, besides which it would be inconvenient when the ball goes out of bounds and you have to chase it down a 2,000 foot dropoff. We stopped many times along the highway for photo opportunities, saw a few more elk and a lot more tourists. The Alpine Visitor Center was indeed large and informative and incredibly crowded. I couldn’t imagine the crush in mid-summer. From that point it was all downhill heading out of the park, though not too quickly as there was some waiting for road maintenance crews and invariably getting stuck behind someone in their massive, road-clogging RV. But I was in no great hurry to leave. 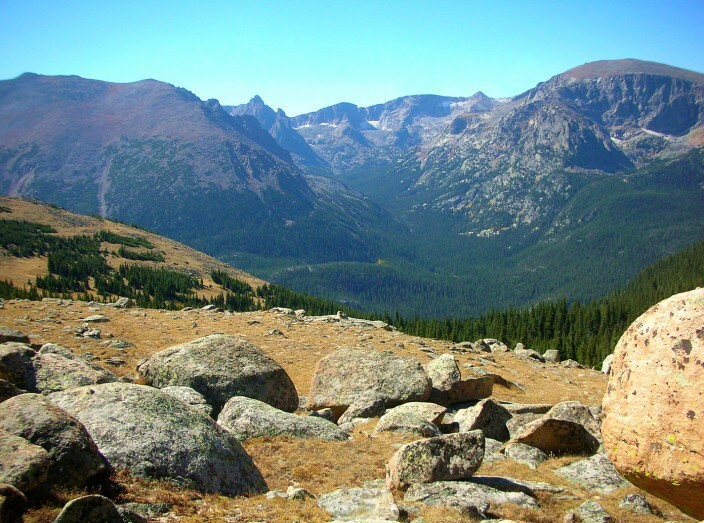 This short jaunt through RMNP was so brief as to seem like only an introduction to me. 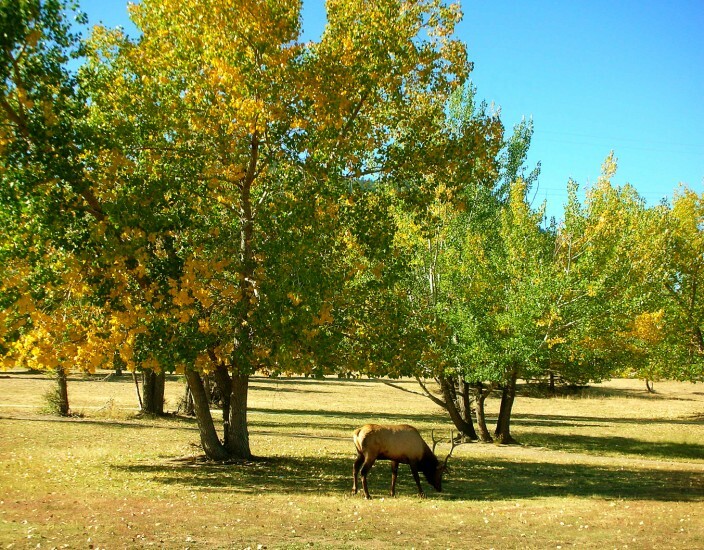 A drive-through simply doesn’t do justice to what this park has to offer. This is a park to get out and explore on foot, and I hope to some day have the opportunity to return and do just that. 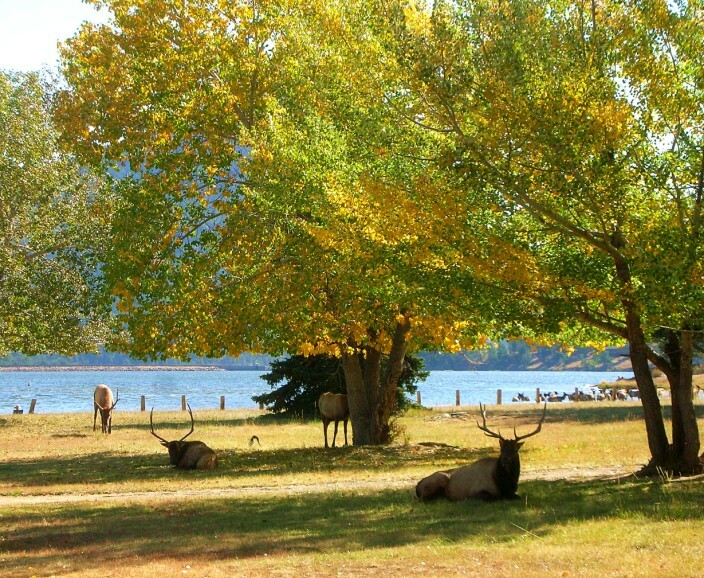 We’d planned to stop roadside and have a picnic, perhaps along the shore of Lake Granby, just outside the park. But we never really found a decent area to stop, so kept driving until we found some picnic tables near the intersection of Highways 34 and 40 close to the town of Granby. It wasn’t the most scenic of locations, but it did have a view of some migratory bird wetlands which at this time of year were pretty much dried up. Anyway, we were hungry and it served the purpose. From there we took Highway 40 which follows a generally northwest direction through all sorts of beautiful alpine country. As I’ve stated before, at some point you simply run out of superlatives to describe the scenic beauty of this mountainous terrain. 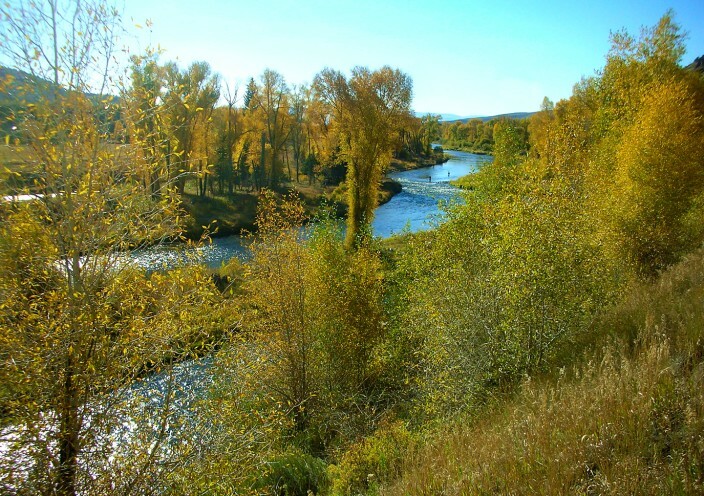 We rolled along past the town of Hot Sulphur Springs and hamlets like Parshall and Kremmling, all of it the type of countryside which makes a driving trip like this such a uniquely American experience. No passport needed, no border stops, no security checkpoints, just gas up and go. Here’s hoping we never lose that. Dropping down from the higher ranges and heading into Steamboat Springs was an incredible sight with the valley and town laid out below. But passing through Steamboat Springs was a major headache I was not prepared for. I’d heard of Steamboat Springs before, primarily in regard to it’s reputation as a winter weather ski resort and playground. But we learned it’s also very popular – and very crowded – in other seasons as well. Add to that the inevitable road maintenance right in the middle of town where Highway 40 morphs into Main St. and it took us about half an hour just to slog from one side of Steamboat Springs to the other. After that it was more smooth westward cruising. 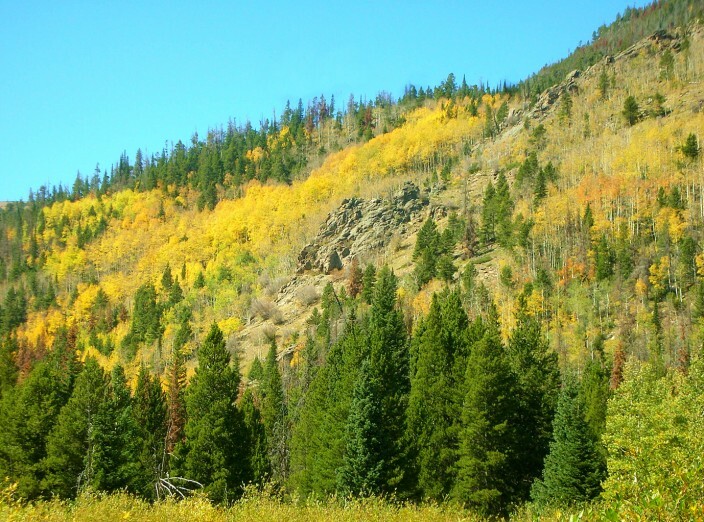 We’d left the higher mountains behind and entered another farming and ranching area of bucolic fields and streams, with hawks soaring above the haystacks and aspens and the lowering sun casting a golden glow on everything. It also threatened to blind me at every turn in the road. At the town of Craig we left 40 and turned north on Highway 13 into an arid land of rolling hills that reminded me of portions of eastern Washington. We saw very few homes and hardly any sign of human habitation. As the sun dropped below the hills, dusk quickly took hold of the landscape and it became increasingly difficult to see the road well in the shifting light. What really worried me were the number of deer and antelope I’d seen grazing on the slopes and along the margins of the unfenced highway. As had happened too often on our journey, I’d hoped to be farther down the road by this point in the day. What I’d wanted was to make it to I-80 by dark and then stop for the night in Rock Springs. We crossed into Wyoming and soon hit the tiny village of Baggs, which had been my back-up plan for a motel, but Baggs was much smaller than I’d expected, with only a few houses and nowhere to eat or sleep. We pushed on into the gathering darkness and I became convinced, irrationally or not, that sooner or later around one of the endless curves in the road, a deer was going to be staring back at us transfixed in my headlights and whammo, road kill city. And dark? We’re talking cave on the bottom of the ocean at midnight dark. There were no lights whatsoever other than the rare sighting of another vehicle and the occasional spooky, glowing eyes of some critter off on the side of the road. It all added up to the most unpleasant, exhausting, white knuckle drive of the entire trip for me. In reality it lasted less than an hour, but felt like a whole lot more, and coming at the end of a long day near the end of a very long trip, I’d never been so glad to see the lights of civilization in my life as when I-80 finally came into view. We entered the freeway heading for Rock Springs, about 80 miles west. I’d just begun to relax and feel good about the prospect of soon getting out from behind the wheel when the flashing lights of a State Patrol cruiser directly behind me lit up in my rear view mirror. I felt the usual jump in pulse and blood pressure which accompanies this, even though I hadn’t the slightest notion why I was being stopped. I’d been driving right at the speed limit of 75 because I’d seen this guy a couple miles back sitting on the shoulder with his lights on. So I pull over. He comes up. Do you know why I stopped you? I have no clue. Because one of your headlights is out. Oh. No wonder it was so bleeping dark out there! Well, in the end there was no harm done, other than to my already frazzled nerves. He was decent about it, gave me a warning, get it fixed, yes sir, I will. We rolled on to Rock Springs and struck out on our first motel attempt with a no vacancy. I had to wonder, who are all these people staying in Rock Springs, Wyoming? It’s not exactly a vacation hotspot. We backtracked one exit and finally found a room at the Super 8. I’m tempted to rate it 5 stars just because we were so happy to have a bed and a shower nothing else mattered at that point. But honestly, it was on the second floor with no parking space nearby and I had to schlep our stuff a long way up to the room, so I’ll give it a four and leave it at that. I fell asleep still feeling phantom road vibrations and dreaming of antelope leaping over the hood of my car.